The modern world is faced with a new epidemic: teen suicides. One in three teenagers in the world of The Program commit suicide. It's treated as an infectious disease, and scientists and doctors around the world scramble to come up with a cure. A few states -- including Oregon, where the story is set -- have implemented the Program, an in-patient treatment where the patients' infected memories are removed and they are returned to society calm, happy, and well-adjusted. At least, that's the theory. And it certainly seems to be working. The Program carefully monitors and watches teenagers for any signs of depression and "infection." Parents are encouraged to turn their children in if need be. But not everyone wants to have some of their memories erased. Not everyone sees these alterations as a good thing. Sloane and James are trying to be careful. 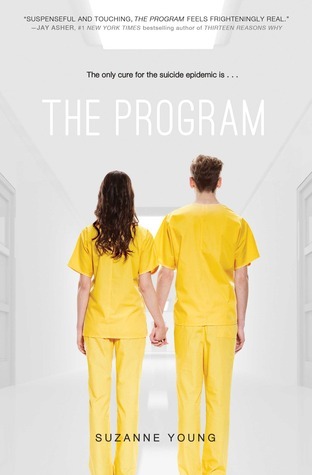 Despite the infection of close friends and the suicide of Sloane's brother and James' best friend, the two try to keep each other grounded and stable...long enough to turn 18 in less than a year, when they can be free from the Program's reach. But their grief and the stress of trying to keep it hidden and put on a happy face eventually get to them, and eventually the Program gets to them as well. I'm pretty picky when it comes to dystopian novels these days, but this is a pretty good one. It's a little heavy on the teen angst, but I think appropriately and realistically so. I mean, you're talking about a book about teen suicide, grief, the idea of true love, and all the intense, passionate emotions that just come as part of being 17. And I think the book does a good job of highlighting the importance of validating and working through strong and tough emotions, of getting REAL help when needed -- not just forcing people to put on a happy face and say everything is ok. I also think the author did a great job of creating a truly disturbing and terrifying atmosphere. I spent a good chunk of this book stressed. out. Worried for our main characters. Creeped out by the Program handler who is clearly smarmy and gross (and yes...proves to be just that). Distrustful of people who aren't as they seem, and horrified by the forced medication and manipulation of the patients. Oh, and it's not a stand-alone novel. A few things are resolved at the end, but it's definitely not a fully satisfying ending. Bottom line: if you're in the mood for a dystopian novel, this one won't disappoint. 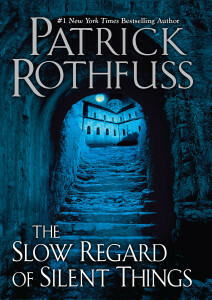 The Slow Regard of Silent Things by Patrick Rothfuss is a unique novella that is less story and more character study. It's a snapshot in the life of Auri, a minor (if you simply go by page count) character in Rothfuss' Kingkiller Chronicles. It's not a book for everyone -- if you like plot and action then you may not like it. But if you like really getting to know a character then it's pretty great. If you appreciate words and beautiful writing, it's pretty great. I will say, that it doesn't really stand alone. It's best read if you've read the other books in Rothfuss' trilogy. So...maybe the shortest and least helpful book "review" in history, but it's what I've been up to! Reader, writer, librarian, musician, runner, amateur cook and baker, and beginning knitter. Lover of the outdoors, a strong cup of coffee (black), and English breakfast tea (milk and sugar). Jesus follower, wife, mother, sister, daughter, friend.